I come from a third generation of booksellers – so you might say that books have always been my destiny and they certainly are my passion. My grandfather was a Polish bookseller and collector of rare books before World War II. Sadly his bookstore and most of his collection was destroyed during the final bombing of the city of Poznan. There is only a handful of books that survived, but one of them is an extremely rare hand-printed book of Japanese poetry. My mother carried on the tradition of family bookselling and married a man who was first trained as a printer, but went on to work in a small publishing house. As far back as I can remember our tiny apartment was always full of books and often full of writers having big political discussions around our kitchen table. I always loved reading, but rebelling against ‘following in my parent’s footsteps’ – I vowed not to work in a bookshop. I left Poland at the age of 19. It was really hard to start a new life with limited language skills and no friends and family, but I quickly discovered that bookstores were the best places to cure my homesickness and help me understand new countries. Here I came across old friends – classics and authors that I’d read over the years, but I also discovered a the whole new world of books and authors that I’d never heard of. It was not long before my vows were forgotten and I started working in a bookstore. Although I moved countries a few times, I never left the book world, spending my working hours in bookshops in England, Switzerland, Canada, USA, Australia and New Zealand. I made a move to the publishing side about three years ago and although I do miss bookshops, I also enjoy this different way of ‘making’ books. Do you keep all the books you read on your shelves or only your favourites, does a book have to be REALLY good to end up on your shelves or is there a system like one in one out, etc? 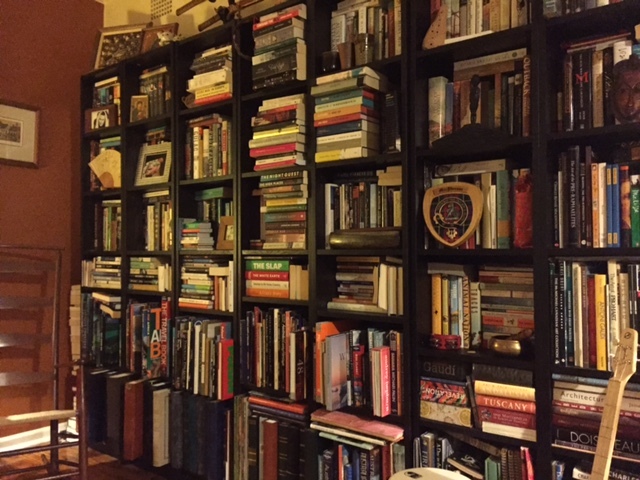 There is no way that I could have possibly kept all the books I read, but I did become very creative in finding new ways of stacking books ;-)….. My current library has over 3000 books, and I regularly do some ‘pruning’. I keep books by all my favourite authors (and there are quite a few of them) and I collect books in a couple of specific areas. Although I reinforced the floors under the part of the library that holds most of my hardcovers, I often pray that my little house does not collapse under the weight of all these books. 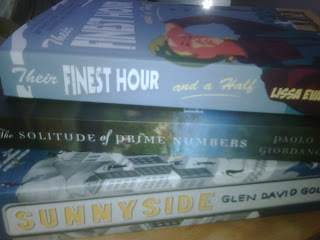 I am also trying to make more use of my local public library to reduce the load on my bookshelves. Do you organise your shelves in a certain way? 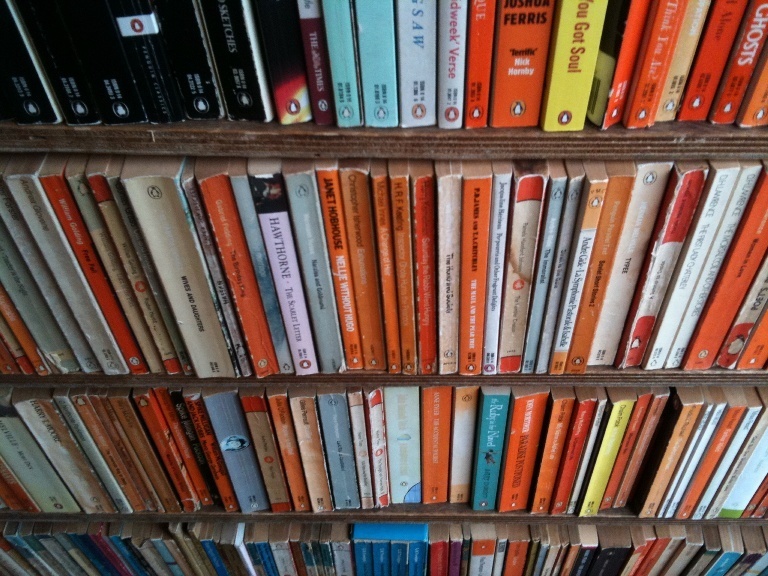 For example do you have them in alphabetical order of author, or colour coded? 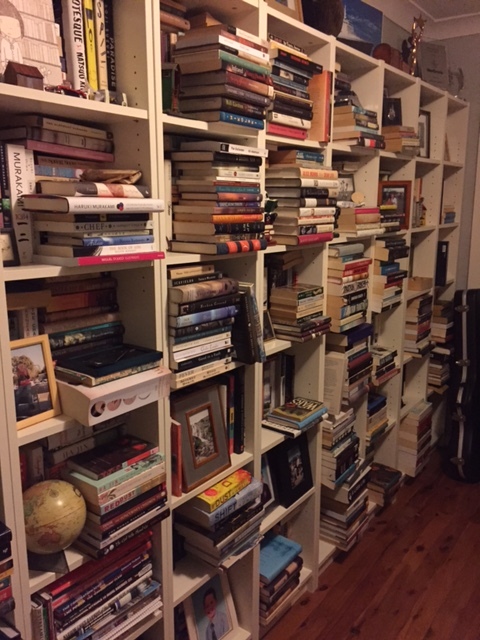 Do you have different bookshelves for different books (for example, I have all my read books on one shelf, crime on another and my TBR on even more shelves) or systems of separating them/spreading them out? 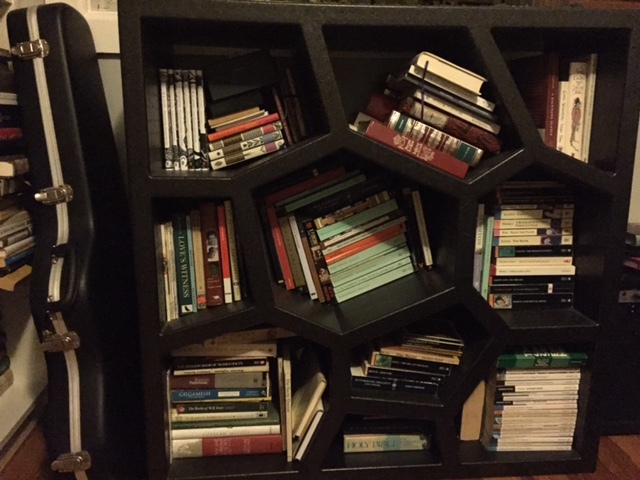 Do you cull your bookshelves ever? Yes, I definitely have a system going. First my books are divided by the three languages in which I read; secondly they are divided by fiction and nonfiction. Nonfiction is divided into subsections: history/politics, arts, nature etc. with two special subsections in which I collect books about history of women and books about books, libraries, reading etc. My fiction section is divided by continents and then by the country of the author’s origin, the two biggest parts being dedicated to Canadian and Australian writing. I also have a special section for classics and poetry … and then there are of course my various stacks, books to be read later, books to be read now, books that I am dipping in and out of etc. etc. Yes, I know it’s all a bit mad. What was the first book you ever bought with your own money and does it reside on your shelves now? My first recollection of books I bought with my own money are The Moomins by Tove Jansson. I was probably about 7 or 8 when they started appearing in Poland and I saved money for them in my little piggy bank and yes I still have them. I still love them and have added to the collection over the years. Are there any guilty pleasures on your bookshelves you would be embarrassed people might see, or like me do you have a hidden shelf for those somewhere else in the house? My guilty pleasures are some of the horror novels (especially Japanese) and lots of mysteries, but I am not embarrassed by them and they live on the shelves in perfect harmony with all other books. Which book on the shelves is your most prized, mine would be a collection of Conan Doyle stories my Great Uncle Derrick memorised and retold me on long walks and then gave me when I was older? Which books would you try and save if (heaven forbid) there was a fire? This is the hardest question – I honestly could not name a single book. It would be more like an armful of books. 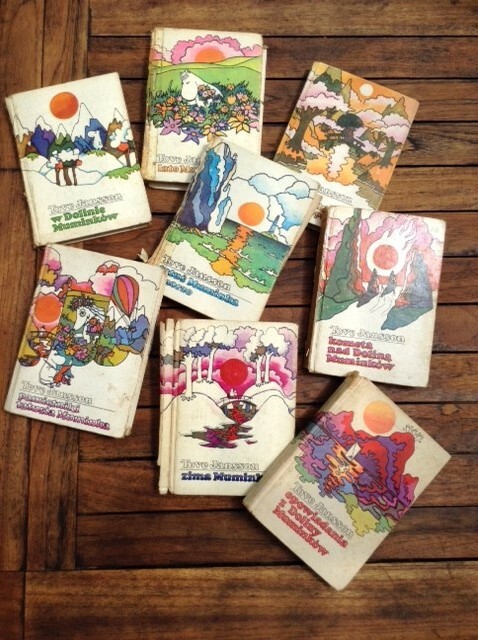 I would definitely want to keep my original Moomins, but I also have an amazing collection of signed books. Most of these carry memories of unforgettable encounters and long conversations with extraordinary writers – these include books by my favourites – Margaret Atwood, Alice Munro, Michael Ondaatje, Gunter Grass, Peter Carey, Richard Flanagan, Jose Saramago, Umberto Eco, Salman Rushdie, Anthony Marra, J.K Rowling and so many more. I also should single out my 1st Canadian edition of Life of Pi. Sorry, I know it sounds like a lot of name dropping, but over the years I have been very privileged as a bookseller to meet some truly remarkable people. What is the first ‘grown up’, and I don’t mean in a ‘Fifty Shades of Grey’ way, that you remember on your parent’s shelves or at the library, you really wanted to read? Did you ever get around to it and are they on your shelves now? Probably some of the American classics of the 20th century, I distinctively remember being in high school and discovering a whole shelf of them in my parent’s library – books by Joseph Heller, Irvin Shaw, Ernest Hemingway. I had a preference for dark stories and that has not changed. If you love a book but have borrowed the copy do you find you have to then buy the book and have it on your bookshelves or do you just buy every book you want to read? If I really loved it yes I would go and buy it, but I no longer buy all the books I want to read. I really enjoy using my local library. What was the last book that you added to your bookshelves? I bought this week The Mothers by Brit Bennett, on a recommendation of my favourite Australian bookshop: Readings in Melbourne. (I am ¾ into it and I would highly recommend it too) and I borrowed a copy of The Spinning Heart by Donal Ryan on the recommendation of another author Aoife Clifford, whose reading tastes I always respect. I do have to add here that both you and Kim from readingmattersblog are very trusted and frequent source of recommendations too. Are there any books that you wish you had on your bookshelves that you don’t currently? Nothing that I really would lose my sleep over, but I always have lists of books that I would like to read. What do you think someone perusing your shelves would think of your reading taste, or what would you like them to think? Well it is quite a mix of books that I have – so the only thing that I hope people would say is that I have an open and curious mind. 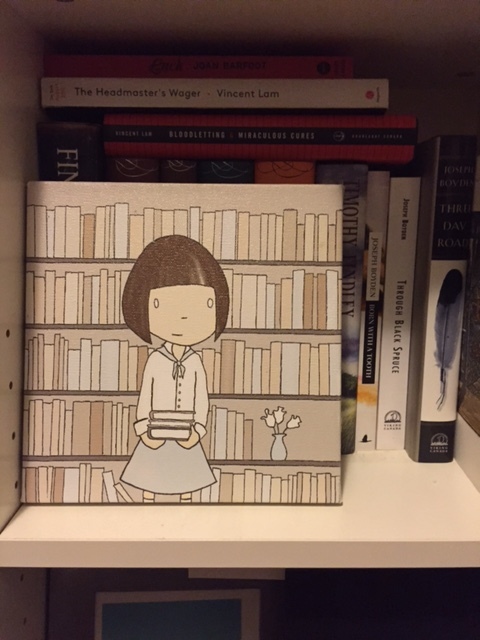 A huge thanks to Anna for taking part in Other People’s Bookshelves.. If you would like to catch up with the other posts in the series of Other People’s Bookshelves have a gander here. Don’t forget if you would like to participate (and I would love you to – hint, hint, hint as without you volunteering it doesn’t happen) in the series then drop me an email to savidgereads@gmail.com with the subject Other People’s Bookshelves, thanks in advance, I am catching up with all the latest volunteers. In the meantime… what do you think of Anna’s responses and/or any of the books and authors that she mentions? Yesterday the bookish world, well in the UK at least, seemed all a twitter with the story of a new literary prize, called, erm, The Literature Prize. I am a big fan of any new book prize, both having co-founded one myself and because they promote books which is no bad thing in the current book climate, books need all the pushes they can get. However it seems to be that The Literature Prize has started out with some interesting, if unsettling, intentions and in a blaze of retaliation towards another prize, not the most positive of starts is it. Books, glorious books, would any of these have won The Literature Prize? When I jumped on board co-founding the Green Carnation Prize last July it was from a place of positivity. Ok, we did give it the name ‘The Man Fooker’ and it was from a comment of frustration on twitter by Paul Magrs that there was no platform/prize for works by gay men (now we include all LGBT authors) in the UK. Yet we set the prize up in a whirl of excitement and positivity, we didn’t start slagging other book prizes off, we weren’t snide, and we don’t aim to be. We simply wanted to make it happen. We also wanted to be inclusive of all works of literature and their diversity like readers and their reading habits, not just The Literature Prize’s specific aim to “establish a clear and uncompromising standard of excellence”. Yet who is setting/deciding the standard? It appears that the answer to that won’t be revealed for another few weeks. The bit that made me get all the more cross was the snidely aimed “For many years this brief was fulfilled by the Booker (latterly the Man Booker) Prize. But as numerous statements by that prize’s administrator and this year’s judges illustrate, it now prioritises a notion of ‘readability’ over artistic achievement.” Firstly that to me sounds like ‘let’s get some press off another prize which is very successful’ (and it has been successful this year there’s a couple of great books on the shortlist and they are selling like hotcakes). Secondly it implies that the judges, people who read are too stupid to understand artistic achievement and so go for dumb down ‘readability’ instead. Within hours of this announcement there started a raging debate about what the difference is between ‘literary’ and ‘readability’ or if indeed there really is one. I think the two can be mutually compatible. In fact the best books have that mix of being stunningly written, transporting you to another place in time or culture and living with its characters for however long the read takes. I think this can be done whilst making the reader want to do nothing but read that book whether it is plot or prose driven. The reader gives their dedication, time, energy and imagination to the book and the partnership between reader and writer is cemented. A book is designed to be read, learnt from and enjoyed. It shouldn’t be so ‘artistic’ no one can cope with it, unless you are a scholar, which leads me to my next annoyance. The ‘academy of judges’. Now, if I am being generous I am hoping that my initial ‘you elitist bunch of *****’ reaction is unfair and that actually The Literature Prize will find a diverse ‘lottery’ of judges, not as I fear a bunch of academics who may alienate the common reader (that isn’t meant offensively). I think a perfect panel of judges would be a group of writers, journalists, literature teachers, bloggers, librarians, book group leaders but most importantly ALL avid readers. The main criteria for a book judge should simply be that they love books; they want excellent books to be getting noticed and they want to recommend their favourites to all in sundry. My final annoyance is that, and apparently it is being currently procured, I bet you this prize gets a stupid amount of money thrown at it. Part of me in all honesty is disheartened because The Green Carnation could do with some for promotion etc, the judges do it all for free, but more importantly what about established prizes like the John Llewellyn Rhys Prize which didn’t happen this year due to lack of funding and has been doing a wonderful job for decades? That to me seems unfair, but then life is I guess. There is also the fact reading and readers are changing as they have for decades. Who knew back in the day that a popular romance novelist would become a classic and admitted author, she’s called Jane Austen, I don’t know if any of you have heard of her. Or that a serialised newspaper author or three would become deemed some of the greatest writers of British history, like those guys called Charles Dickens, Wilkie Collins and Sir Arthur Conan Doyle. They wouldn’t have won The Literature Prize if it had been conceived then would they? That said they probably wouldn’t have won the Booker either. Aren’t we as readers always changing? Don’t our tastes change from book to book? Maybe it’s a generational thing, but I don’t want a book that meanders forever and ever in its own glory and prose and self satisfied nature, I believe that great characters, plots and escapism can be readable and literary, or maybe that’s just my taste. I bet Susan Hill isn’t looking for the same criteria in a book as she judges the Man Booker now as she did in the 1970’s, her reading and its tastes will have evolved even if in subtle or unconscious ways as life changes as it does for all of us. Some of us like to go from an Alan Hollinghurst to an Agatha Christie, from a Charles Dickens to a Stephen King or from David Nicholls to Umberto Eco. That’s the joy of reading, its diversity. Who knows what the future of the The Literature Prize is, indeed the cynic in me says it could simply be a bit of pre-Booker announcement hype with its shroud of mystery; as with no announcement of who the board is, who is funding it or if indeed it will make its debut in 2012. Hmmm. I wish it luck, should it come to fruition, I think maybe it needs to change the way it holds itself in public in the future though, be less a prize trying to do what another prize already is (and sulking it’s not doing it as it feels it should) and then find its own voice and the ears of all readers out there. It has one thing going for it; it has certainly caused some interesting debate about books, readability and literature. What are your thoughts on the new prize? Do you think readability and ‘literary merit’ are mutually exclusive, or should the best books have a percentage of both? So… the latest Savidge Reads Big Reads (nee Savidge Big Weekenders) and one which as I mentioned on Monday I very nearly came to give up on. However despite my initial struggles with The Name of the Rose by Umberto Eco I carried on (struggling) right until the end. Was it worth it? In honesty the jury is still out on that for me to be I don’t think I have ever felt so confounded by a book or so annoyed that I found a book so difficult. The Name of the Rose is set in 1327 in an Italian monastery where Monks are dying in mysterious ways. In a time where the Catholic Church is dividing and differing Catholic communities are accusing each other of heresy emotions are running high. Brother William of Baskerville and his companion, and the narrator, Adso arrive after the first death and turn detective and sidekick as they try to unravel the mystery. Now this makes it sound like your average historical murder mystery but it is so much more than that. Umberto Eco’s novel is undoubtedly a masterpiece, however for me it was an alienating one. Unlike when I read The Blind Assassin a few weeks ago the hard work didn’t seem to pay of with The Name of the Rose. I am not a religious person, I have nothing against it at all – the Non-Reader is Catholic, but I do find the history of religion interesting. However when the history of it is told for five pages a chapter and the same stories of heretics and the anti-Christ are reworded and repeated making what would be a great 250 page mystery into a 500 epic even a die hard theologist would have trouble with this book. The prose is stunning though in all honesty I think Eco might work by the rule of ‘why use one word when I can use a paragraph’. The interspersed Latin I found slightly pretentious and a bit ‘look how clever I am and you aren’t’ which slightly alienates a reader, well it did me anyways. I don’t want a book to make me feel stupid. Now bare in mind I know some Latin, my mother being a Latin, Classics and English Literature teacher, I am not even someone who has no knowledge of it and I found it grated on me and to only then be reworded in English just seemed like more words to bulk up the book. I also never felt I got to know the characters as there were so many of them and though I did really like Brother William of Baskerville and Adso as characters I never quite felt on side with them because sure enough one of them would soon be spouting paragraphs of Eco-isms and I would be put of them for a fair few pages. As for all the other characters well with all the similar names I would sometimes think that they were talking to a character that I would suddenly realise had been dead for a few pages. Back to the positive however I thought the book had moments of genius, the mystery and suspense was wonderful when it was in the book and not being shrouded by Eco-isms. Joining William and Adso as they ventured through the dark twisting labyrinth of corridors, secret passages, turrets and the amazing library of the monastery did have me on the edge of my seat. I just wish the whole book had been like that, that would have been superb. I would give the book 2.5/5 it wasn’t awful (I hate giving bad reviews – I try and see the best in all books, especially when I have always wanted to read them and when the Non-Reader has bought me a book… a very rare event) and had moments of spell binding brilliance but to me it was as my mother (it’s normally my Gran that is famous/infamous on this blog) said only yesterday “oh I thought that book was a really good mystery surrounded by pretentious twaddle” and I have to say I think she was right. Though don’t tell her that I wouldn’t hear the end of it! She also said “it’s one of the rare books that is better as a film” I shall find out as I have ordered it from Lovefilm to see if it makes more sense that way. The latter two arent out until June, so do you think its ok to leave reviews and reading until nearer the time of release? Hmmm, a puzzle and a conundrum I hadn’t thought of before. So The Blind Assassin… no review just yet its more likely to be tomorrow that I have it up and online. I have still got about 190 pages to go but am giving myself the night off to devour the final pages. So far I am really enjoying it, I can see why other people might not though. It’s definatley a book to take your time with and though the print is quite big its misleading! So the first Big Weekender Review is running a little bit behind now… whoops! So thats all the latest. Oh actually not quite, I need your advice, Savidge Reads Towers appears to have mice (its a Victorian house in London enough said) how can we humanely get rid of them, and most importantly… they don’t eat books do they? That title makes it sound like I am hosting some sort of blogging/book festival every weekend which sadly I am not. Wouldn’t that be a wonderful event though, lots of book bloggers under one roof discussing books for a whole weekend, you could even get publishers and authors in on the act too… maybe I should trademark that? That’s actually really got me thinking! Anyway sorry I digressed. I am debating between The Comapny fo Liars by Karen Maitland and Sea of Poppies by Amitav Ghosh after that? If anyone would like to join in that would be wonderful hence why thought would give you the list of what’s coming and we all like a challenge don’t we? I will do the review on the Monday after the weekend of the chosen book and then if you have read it you can leave your thoughts and comments too? Might make interesting discussion, this week the review will be up tomorrow (I should have finished it by then). I would also love to hear your suggestions for ones that I should consider in the future. The only criteria are they need to be more than 500 pages, maybe even 550 and yet less than 850 pages. Can’t wait to see what you suggest. So far am 200+ pages into The Blind Assassin by Margaret Atwood and loving it I can already tell there is going to be a big punch in the end. Though isn’t it annoying when you start a book and tell people, or they ask you and then say things like ‘oh god no, I thought that book was awful, I liked her early stuff but that book was dire’ or ‘have you tried The Robber Bride… oh you didn’t like it and couldnt read past 100 pages, shame as its much better than that one you’ve started.’ Fills me with hope that doesn’t it? So far they are both wrong… we will see. I wasnt going to blog today as have been on one of the shortest but most important deadlines of my writing career today and been literally sat at my computer pulling my hair out, fortunately it has all turned out very well the piece is loved by all. Enough of that though one thing I forgot to blog about (because I was busy being a birthday boy) was whether I got any books for my birthday on Tuesday the answer was yes… three! Blurb Says: Things have never been easy for Oscar. A ghetto nerd living with his Dominican family in New Jersey, he’s sweet but disastrously overweight. He dreams of becoming the next J.R.R. Tolkien and he keeps falling hopelessly in love. Poor Oscar may never get what he wants, thanks to the Fuku – the curse that has haunted his family for generations. With dazzling energy and insight Diaz immerses us in the tumultuous lives of Oscar; his runaway sister Lola; their beautiful mother Belicia; and in the family’s uproarious journey from the Dominican Republic to the US and back. Rendered with uncommon warmth and humour, “The Brief Wondrous Life of Oscar Wao” is a literary triumph, that confirms Junot Diaz as one of the most exciting writers of our time. Non Reader Says: It has won one of the biggest book prizes, and a prize you say is much more reliable than the Man Booker in terms of actual winner. It sounded a bit obscure whihc is very you, whist at the same time being modern. You have also picked this book up and ummmed and ahhhed about it every time we have been in the book stores in the last month. Blurb Says: Beth is an albino, half blind, and given to looking at the world out of the corner of her eye. Her neighbours in the Derbyshire town of Blackmoor have always thought she was ‘touched’, and when a series of bizarre happenings shake the very foundations of the village, they are confirmed in their opinion that Beth is an ill omen. The neighbours say that Beth eats dirt from the flowerbeds, and that smoke rises from her lawn. By the end of the year, she is dead. A decade later her son, Vincent, treated like a bad omen by his father George is living in a pleasant suburb miles from Blackmoor. There the bird-watching teenager stumbles towards the buried secrets of his mother’s life and death in the abandoned village. 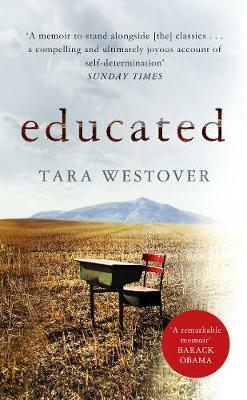 It’s the story of a community that fell apart, a young woman whose face didn’t fit, and a past that refuses to go away. Non Reader Says: It’ set in your homelands of Derbyshire and a place that we both think is stunning and has a dark side. This book looks like it might be mysterious and spooky and I actually might want to read it after you. Blurb Says: The year is 1327. Franciscans in a wealthy Italian abbey are suspected of heresy, and Brother William of Baskerville arrives to investigate. When his delicate mission is suddenly overshadowed by seven bizarre deaths, Brother William turns detective. He collects evidence, deciphers secret symbols and coded manuscripts, and digs into the eerie labyrinth of the abbey where extraordinary things are happening under the cover of night. A spectacular popular and critical success, “The Name of the Rose” is not only a narrative of a murder investigation but an astonishing chronicle of the Middle Ages. Non Reader Says: You like murder mysteries and crimes and always saying that you can guess the outcome. You like history but don’t understand religion so I thought this might teach you something. It’s meant to be a ‘classic’. Plus you have been saying to yor Gran that you really want to read it quite a few times on the phone. Has anyone helped the Non Reader without me knowing… most puzzling!